Elza van Dijk’s studio is situated in a beautiful and relaxing location. The sounds of water and mood-setting background music will inspire every person with passion in their souls to let loose on their creativity. Learning and crafting with ceramics awakens an inner tranquillity that produces a sense of self-awareness and connection with your surroundings. Unique tableware, vases and sculptural pieces for the home are created to encourage awareness and inspires a “be kind to Mother Earth” lifestyle. Plates with inspirational words or water-wise cacti in unique recycled clay vases are just a few of these inspirational items. Environment and kindness to Mother Earth is key in this studio as every little bit of clay is recycled. And yes, paper and plastic too. A variety of bisque ware is also available for painting should you wish to express your creative side without getting down and dirty. The bisque ware is also perfect for mosaic, glass slumping or decoupage. This is a place for hippies and professionals alike. Elza encourages and teaches with compassion and from the heart. You cannot help but leave with confidence, a renewed passion for life and respect for your own abilities. Only a while after you leave will you realize that you have learned more than just to play with clay. Elza van Dijk is an independent potter and teacher practicing the art in most of its forms like bisque ware, glazed and non-glazed items, controlled oven firing, pit firing, raku and lately a passionate disciple of sculptured, architectural and landscape ceramics. She graduated from the University of Pretoria in 1984 with a BSc degree in domestic science with additional credits in adult education. Directly after university she worked as a dietitian and also as senior advisor, facilitator and consultant with the Meat Board. There was however always the creative urge that inspired her from childhood to transform ideas into artistic objects, from clothing design to the first tentative steps in the world of ceramics. Whilst working as domestic science consultant she started pottery classes with Rhoda Henning and soon after were producing work from her home on a part time basis that she sold privately or through studios she was involved with. 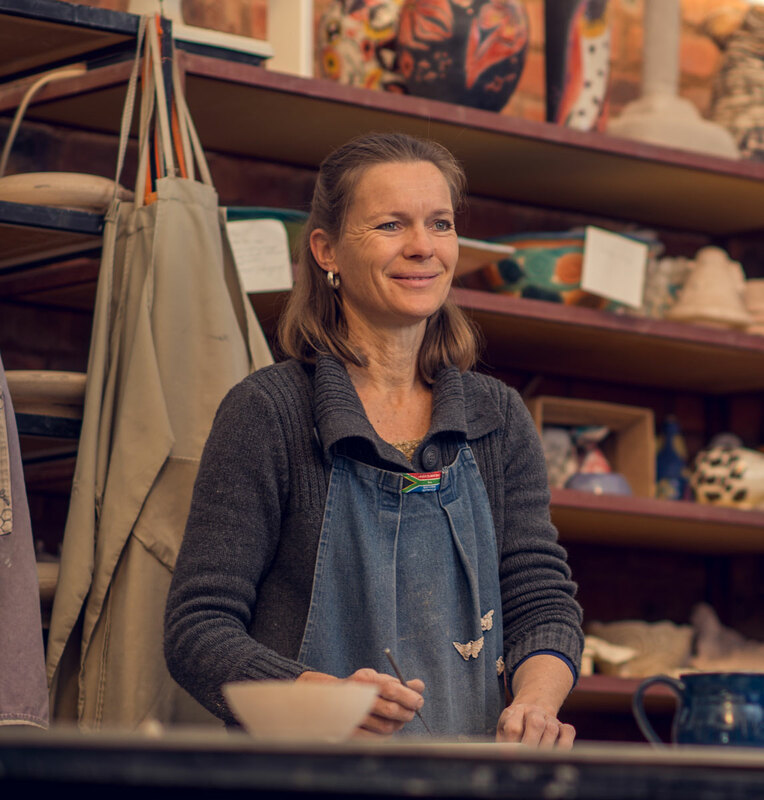 In 2002 she chose pottery as a full time career and moved into her own studio building where she produced a wide range of custom made forms for slip casting and production of bisque ware. During this time she started experimenting with various techniques involving recycled clay and different firing methods to optimize production and energy usage, as well as the possibilities of clay as a medium to create art.